I. and F., two second graders, asked me to help them find Underwater Dogs, a beloved book of underwater canine photography, so that they could read it to Ginger, one of our beloved school pups. Too much cuteness for one school library. If you have questions, please ask them. Along with libraries, bookstores, and readers all over the country, the 5-6s (along with Sam, Jason, and I) celebrated their freedom to read by talking about Banned Books Week, censorship, and intellectual freedom last week. 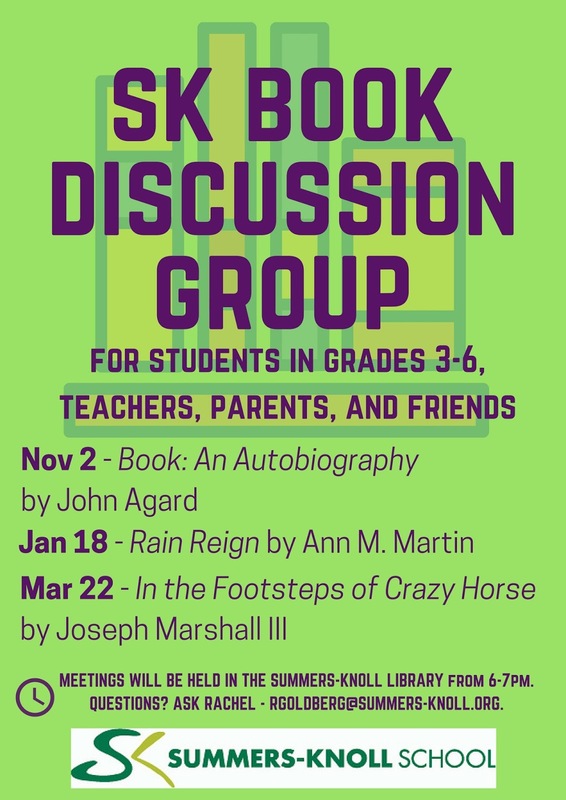 I've been teaching about Banned Books Week for many years and I always love the ideas that come out of this discussion. However, during this past week's 5-6 lesson, the conversation went in a direction in which, in my teaching, it has never gone. In talking about what it means to have the freedom to choose what we read, one student pointed out that the flip side of this is that people also have the freedom to publish books that contain false information or stereotypes. We then talked about how intellectual freedom protects those people and their books, too. This conversation challenged us to think about why people have this freedom and what that means for us as readers. Banned Books Week gave us a chance to pause and consider what it means to recognize that people whose worldview conflicts with our own have the right to theirs, too. Then, of course, the challenge becomes how best to approach these people/books/ideas in a civil, yet assertive and proactive, way. The topic of civil political discourse has come up in my own class (the 7-8s) and I know it's come up in other classrooms at SK, too. The more opportunities we have to work through these difficult questions together, as a community, the better. The readers are back! All feels well in the world (or, at least in our library). K-2 readers checked out their first books of the year. Parents, please note that your child has a library book inside a plastic book bag. Please use the book bag (it's a white bag with a dragon on it and says, "Look what I'm dragon home" on it, which makes us laugh a lot) to transport books and keep them clean. Elaine's class brainstormed a list of good places to read library books (homes, schools, or forests, for example) and less ideal places to read library books (on top of active volcanoes, while skydiving, or while swimming, for example) and I'm confident that our young readers will continue to treat their books like treasures. Please check cars, bedrooms, bookshelves, backpacks, and other likely library book hiding spots for beloved SK library books. When you find said books, please return them to school. 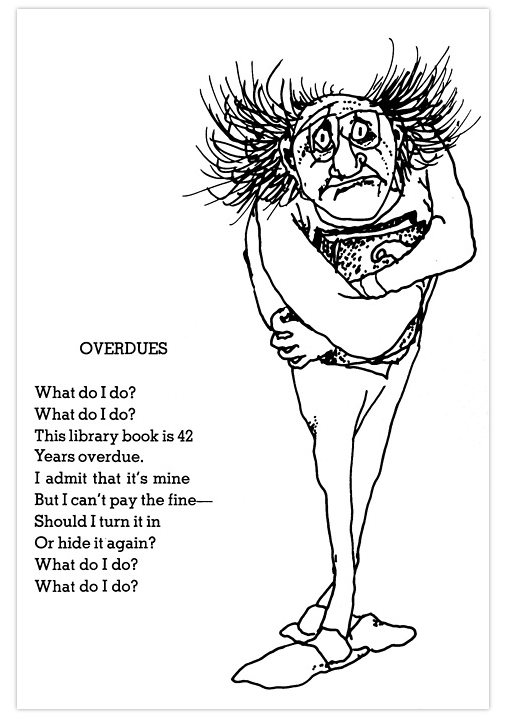 No fines, no questions - we just need the books back. 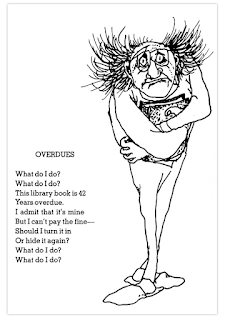 I'll be taking inventory of the library during the first few weeks of the summer and will email families with overdue books. Thank you, in advance, for your patience. On Monday, we welcomed back our dear friend and celebrated author, Alex Gino. Alex came in time to have lunch with some third and fourth grade fans before they led two separate writing workshops for the middle schoolers. After school, some of us joined Alex and our friends at Common Language Bookstore for a reading and book party. Lunch with 3-4s included a conversation about microaggressions; how we identify them and how we can interrupt them. As always, I was delighted by SK students' thoughtfulness and desire to dig deeper. In both writing workshops, Alex challenged students and teachers to think about a character's desires. After writing descriptions of ourselves as characters, we then tried to write a scene with our "opposite": a character who is "opposite" from us in some way(s). We then had a chance to share our writing and reflect on the ways in which we connected with our "opposite" character. After a wonderful reading and conversation at Common Language in the evening, we got to enjoy treats and chat with one another. Huge, huge thanks to everyone who came to the program; our wonderful hosts at Common Language; our dear friend, Jim Toy; and to Alex Gino, for continuing to teach and learn with us. 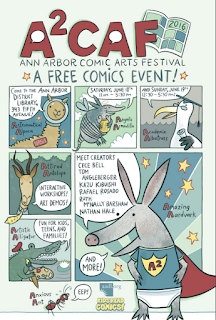 Last week, when Laura Raynor (AADL librarian extraordinaire) was here visiting, she told us all about the Comic Arts Festival coming up in just a few short weeks. 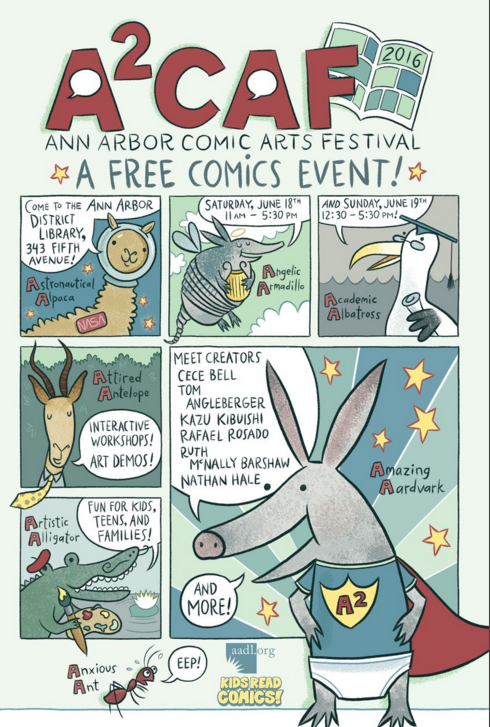 Favorite comic creators like Cece Bell (El Deafo), Tom Angleberger (Origami Yoda), Kazu Kibuishi (Amulet), Rafael Rosado (Giants Beware), Ruth McNally Barshaw (The Ellie McDoodle Diaries), and Nathan Hale (Nathan Hale's Hazardous Tales), among others, will be at the downtown branch of the library for writing workshops, art demos, and book signings. The full schedule is available here. I look forward to seeing you there. Why, yes, that is local celebrity, acclaimed storyteller, and beloved librarian, Laura Raynor, here in the Summers-Knoll library (surrounded by a sea of kindergarten, third, and fourth grade fans). Why, yes, she is holding a velociraptor skull reconstruction (that can be checked out of the library's velociraptor kit, which includes the skull, a real claw, an informational book, and a DVD). Why, yes, she is reading from and talking about some of her favorite new books (which are all available on her public lists, of course). Why, yes, she is engaging our oldest students in a lively discussion of the "swag" available to them when they participate in the library's summer game (which starts June 17). We are beyond lucky to live in a city with such an incredible public library system (staffed by beyond wonderful public librarians, like Laura and her student intern, Lindsey, who visited us this week). Ann Arbor District Library (AADL) is a gem. Thank you, Laura and Lindsey, for sharing your treasures, knowledge, and enthusiasm with us. We hope you'll come back again soon. 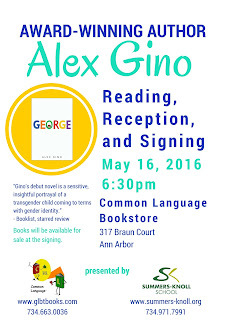 Alex Gino, author of George, is coming back to Summers-Knoll on Monday, May 16. They will lead writing workshops with our middle school students in the afternoon and talk about their writing with the kids. At 6:30pm, please join readers from SK and the greater community as we welcome Alex to Common Language Bookstore. For details, please see the above poster. Discussing a book with its author is a tremendous experience (and watching young people do so is a privilege). I hope to see you there. P.S. 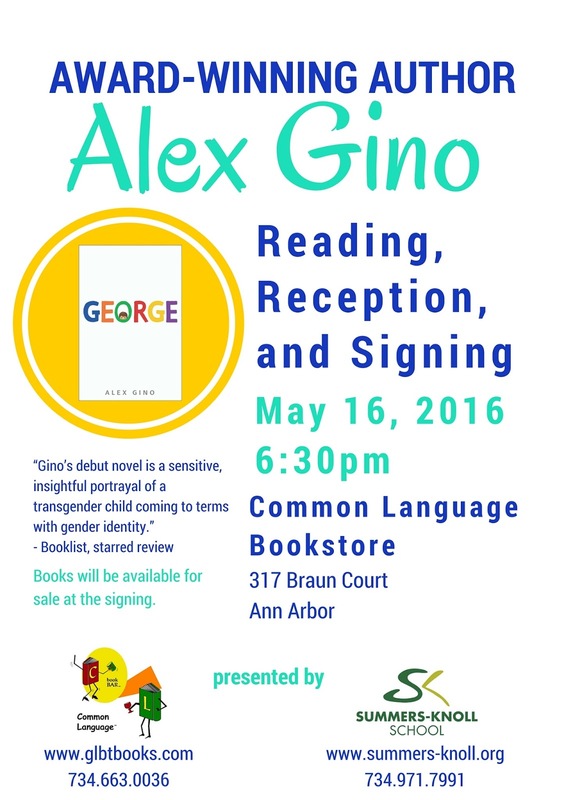 Please help us spread the word about Alex's reading at Common Language. If you use Facebook, please RSVP and share this event with others. The seventh and eighth graders (and Karl and I) have been talking a lot about Photoshop, advertising, and messages recently. The subject came up as part of the Our Whole Lives curriculum (specifically related to beauty standards and the way in which cultural expectations of beauty are defined and communicated) and led to fascinating conversation about the ethical responsibilities of companies/organizations/people who manipulate photos to sell a particular image. 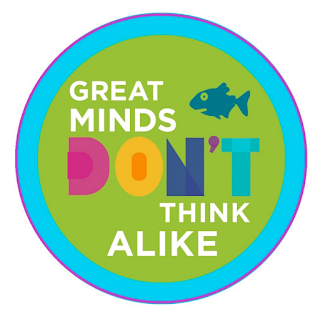 Using parts of Common Sense Media's "Digital Bytes" curriculum, we analyzed advertisements as propaganda, defined various persuasive techniques employed in different advertisements, and examined our own media lenses by thinking about what components of advertising "work" on us. Next week, we'll continue to broaden our understanding of media literacy by digging deeper into what we think the ethical responsibilities of advertisers should be and what repercussions they should face if they mislead the consumer. To continued expanded definitions of "literacy,"
Our library program includes not only what we do with books but also what we do with information, more broadly (how we consume it in a positive, responsible way and how we create it in a positive, responsible way). This includes information we consume (books we read and YouTube videos we watch, for example) and information we create (presentations with slides and science projects, for example). While our younger students keep the information they create in a "hard" format (paper, for example), much of the work that our older students create was born and only lives digitally (slides or reports written entirely in Google Drive, for example). As such, keeping track of information students create changes as they get older and requires new methods. In grades 3-4, I've been working with both classes to organize their work in Google Drive so that they have copies of particularly meaningful projects in a "portfolio" folder. Once we've completed the process of creating, copying, and moving files, students will have an opportunity to reflect upon the work that they have done over the course of their time in the class and comment on it (what they learned from doing it, about which parts they are particularly proud, with which parts they struggled, and so on). This reflective piece is an essential part of regular classroom work at SK and we are hoping to capture that reflection in these portfolio folders. This week, I will begin doing a similar organization of Google Drive folders with the 5-6s. In future years, the 5-6s may also begin to use Google Sites for online portfolios. In Karl's 7-8 class this year, all of the students have created online portfolios using Google Sites. They've also organized their Drives into folders and placed work accordingly. This portfolio-creation process gives students a chance to create, reflect, and grow in new ways. As a school that appreciates the process (as well as the product) of creation and the opportunity for meaningful reflection, we hope that portfolios will give us a new way to express both of those deeply-held values. Last night, I presented a program to some of our parents on our approach to teaching digital citizenship at Summers-Knoll. If you are interested in this topic but were unable to make the presentation, you are welcome to access my slides here. On a related note, I am currently thinking deeply about this review of a very recent study on media use and attitudes among children and parents. I think SK families (particularly those with middle school-age children) will also find the data compelling. For me, the most interesting part relates to "trend two: sponsored content and its reliability." I think that this area is where we have the most work to do (and the greatest opportunity to do meaningful work with young people) on topics of resource evaluation, reliability of resources, and decisions about whom and what to trust online. As always, I hope you won't hesitate to contact me with questions. If you build it, they will sit in it and read quietly and share stories with friends. Magic. On a related note, if you have houseplants looking for a good home, please contact me about donating them to this new cozy space. Books can be ambassadors for you, too. Books can help you understand people from other cultures, religions, even ways of living. Books can help you understand topics that you find intimidated. Books can even be ambassadors for other kinds of books. Let me end by encouraging you to read without walls. Find a book with someone on the cover who doesn't look like you or live like you. Find a book about a topic that you don't know much about. Find a book that's in a format you've never tried before: a graphic novel, a words-only novel, or a novel in verse. Read without walls and see what happens. I bet it'll be something amazing.